Mistral is OpenStack workflow service. The main aim of the project is to provide capability to define, execute and manage tasks and workflows without writing code. Workflow - consists of tasks (at least one) describing what exact steps should be made during workflow execution. Task - an activity executed within the workflow definition. Action - work done when an exact task is triggered. 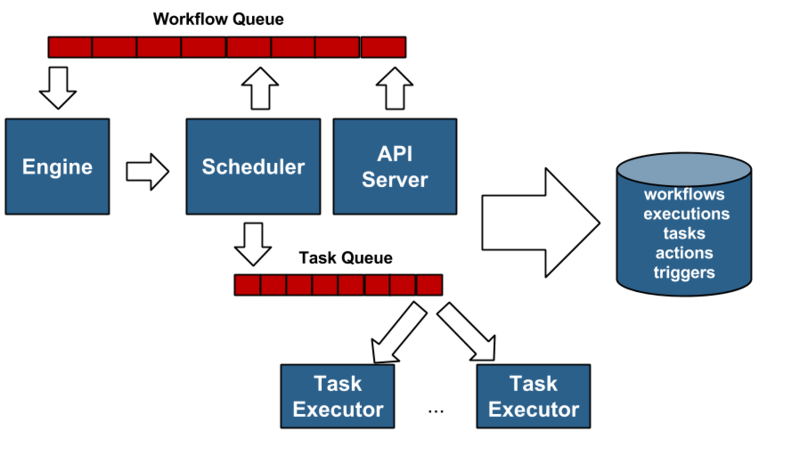 The API server exposes REST API to operate and monitor the workflow executions. The Engine picks up the workflows from the workflow queue. It handles the control and dataflow of workflow executions. It also computes which tasks are ready and places them in a task queue. It passes the data from task to task, deals with condition transitions, etc. The Task Executor executes task Actions. It picks up the tasks from the queue, run actions, and sends results back to the engine. On workflow and task execution, events are emitted at certain checkpoints such as when a workflow execution is launched or when it is completed. The notifier routes the events to configured publishers. The notifier can either be configured to execute locally on the workflow engine or can be run as a server much like the remote executor server and listens for events. Running the notifier as a remote server ensures the workflow engine quickly unblocks and resumes work. The event publishers are custom plugins which can write the event to a webhook over HTTP, an entry in a log file, a message to Zaqar, and etc. The persistence stores workflow definitions, current execution states, and past execution results.